This is part of a series of an alphabet of help for living well, despite everything: I is for Innovation. There will always be at least one apparently valid excuse, and a dozen more rationalizations, in defense of why it just isn’t possible to do what I want to do, ought to do, or hope to do. But if I want to live a purposefully good life, I simply must strike the phrase, “I can’t,” from my list of optional responses to adversity. Here’s the truth: humans have amazingly inventive power. Unfortunately, the innate human characteristic of innovation is frequently used to invent plausible excuses for giving up. I will be courageous. I will innovate a way to succeed. I will stop using my imaginative capacity to make up reasons why I can’t. I will never quit before I’ve tried, and tried, and tried again. I will develop the habit of asking probing questions. I will observe, analyze, synthesize, learn and grow through challenges. I will try, and if my attempt doesn’t work out, I will muster my resources and call for help and try something else. Be it resolved: when confronted with a problem, I will create and implement strategies for coping with the challenge until I overcome the problem. And if the problem cannot be eliminated, I will employ my innovative capabilities to manage my attitude for as long as the problem exists. yes we can figure out a way to live well, despite unfairness and injustice, despite sickness, pain, loss of loved ones, loss of jobs and property, despite everything. I want to thank the many of you readers and friends who have encouraged me to reject self-doubt, self-pity and discouragement. Which dream are you absolutely, unequivocally never, never, never, never, never going to stop trying to achieve? Having just bought one cherry tomato plant, Tracy, I immediately love your deer fence innovation photo. Hurrah! And your blog post is concise and inspiring. The dream I’ve been pursuing with full focus for a year and a half is a life devoted to making a respectful and very respectable living with my music — performing, writing songs, teaching, and anything else that may unfold which taps into my musical gifts and experience. I look forward to reading what others may share from your great community of fellow bloggers. How exciting that you’ve been able to make a living doing what you love. You are indeed a fine example of innovating in order to reach your dreams. Wishing you continued and ever-increasing success. Let me first say that I love the tomato growing structure and fence! That picture looks awfully familiar! You cut right to the truth with this post. We are all innovators and so often its our own worries or insecurities that hinder us from achieving what we know we can. My dream that I’d love to achieve one day, even if it’s years from now, would be to take a ballet class on pointe again. It seems so far fetched but it’s been something that I’ve been dreaming to do even since the day I stopped! Oh, that’s not at all far-fetched. Some people told me it was far-fetched for me dream of being able to run again some day (because of my fibromyalgia, most doctors tried to talk me out of it). It took me 3 years to get the point of being able to run 1/2 mile, two or three times during a 45 minutes walk (total of 1-1/2 miles). And every month, I get a little bit stronger. So, make a plan and…. watch for my J is for (its’ a secret)…. post coming soon! 😉 It’s just what you need. Having read in your book your description of the hot needles of your fibromyalgia, I find it amazing that you managed to run again. And your picture of tomatoes is inspiring. I am hoping, if I manage to move, to concentrate on growing veg in tubs, once freed from all the boring slog of mowing and weeding. I thought I’d never get there, but now, I really can run for half a mile, and it feels fabulous while I’m doing it. I sometimes laugh out loud, because I love doing what someone has said is impossible. We’ve grown veggies in tubs. Tomatoes and peppers work well (with a bit of the right fertilizer), so do salad greens and radishes. What wonderful motivation Tracy. You touch on an important virtue, which is patience and probably more importantly persistence. So often in our fast paced world it’s easy to want everything right now. Some goals are worth taking the time and dedication to work towards. Congratulations on your running success! It’s a small success, in many people’s minds. But hugely invigorating for me! A very timely and encouraging post Tracey – thank you! Of course by Tracey, I mean Tracy. Ugh. I’ve been reading about Finnish schools — there are a couple of people here in Rhode Island who are all fired up about innovating a new way of doing education. Are you happy with the system for your children? I really am happy with quite a few things about the Finnish school system (of course no system is perfect! ):1) I like the fact that kindergarten starts at age 6 giving the children a bit more time of creative play before entering a structured hourly environment. At the moment, kindergarten is still optional but 98% of Finnish kids do attend and the current parliament is making a law that make kindergarten required. 2)I also really like the fact that they have a fifteen minute recess after each class period and of course a longer recess after lunch. 3)School days for first graders are 4 hours long and they incrementally become longer in higher grades. 4)Most kids go to a school that is faily close by and are able to walk or bike. Some take public transportation or receive a school sponsored taxi ride. It’s a great way to get in daily exercise. Our nearest school is 1.9 km away. 5)I have two daughters that have fairly severe dyslexia. They are part of a wonderful program that is integrated into a normal school. It is about a 30-35 minute taxi ride to school for them but the school has professionals that are focused in speech development. The school has about 16-18 teachers and about 23-25 teaching assistants and there are 240 students. Most schools do not have so much staff but this allows for special arrangements. ie. if a child needs to take a test in a separate room so they can concentrate etc. they have the resources to do this. The school also has children in the upper grades (7-9) and since the taxis do one round a day the younger children must also stay longer. For them they have provided a longer recess and during the winter they may skate, ski or sled on alternating days. There is so much research that suggests that exercise and learning motor skills go hand in hand with reading and writing skills. Thank you so much! I’m coping this and printing it. We have a book group discussion coming up, part of the book is about Finnish schools. You’re right, no system is perfect. But the Finnish way seems very good. You probably already know what I am going to write about! As the oldest beginning violin student ever, one of my first innovations was to put away my grandpa’s full-size violin and get a 3/4 size for these less-flexible hands and fingers! I will do whatever it takes to fulfill my recaptured dream! Will I ever play in a symphony orchestra? Will I someday teach violin? Not if I give up and quit – or say “can’t”! I’m so impressed by your gumption and commitment, Darlene. That was a great idea–did you do it right away, or did you try on the full-size for a while first. I’ve been playing almost 15 months, am now in Suzuki Book 2, and throwing in a little vibrato on the longer note at the end of a piece! Grandpa’s violin has lovely tone but my left hand fourth finger has a slight bend at the end joint, so I really struggled with reaching those notes – or was limited to playing them only on the open string. My teacher’s friend let me come to her house and try her 7/8 but it wasn’t that much different from a full-size – she thought I should stay with the full-size, but after renting a 3/4 and playing it for a few weeks, my teacher and I agreed that was the answer. I broke all the rules and ordered one online, and I absolutely love it! You commented on my post on my ‘revival’ identity – making a new self. This post of yours takes that concept to the next level and provides ideas of how one may do that, especially being courageous enough to step out in a creative sense. Where’s the emoticon for “blushing” ? Tracy, I copied “Be it resolved: when confronted with a problem, I will create and implement strategies for coping with the challenge until I overcome the problem” and underlined the “until I overcome the problem.” That’s the part I need to commit to, and you helped me put it in black and white as a reminder. The truth is, Marylin, that I continually need to learn, through commitment, that 2nd part, too. It doesn’t come naturally to me. But I have a good coach and a fine example living with me, which helped me. I’ll tell you what I wanted to give up on…. the social media problem. When I started, I had to learn it all, from scratch, and I found it incredibly intimidating. Now I’m having fun, and I’ve learned from everyone around me. I realize that we all need inspiration and encouragement, and I thank you for giving both to me. Thank you, dear. I needed that affirmation today. You’re such a kind friend. “I” is for inspiration and ingenuity. In reply to your final question – to make those around me happy. I live with two people who generally see the world with a glass half empty attitude – helping them to see the positives is sometimes nigh on impossible, but I’m trying! It’s interesting how we tend to live with people who see the world differently than we do. I’ve recently had a long conversation with a friend of mine, who lives with a pessimistic husband, while she is an optimist. Would you believe my husband thinks I’m a pessimist? I leans toward the more realistic edge on the spectrum of optimism while he never leaves the “it can’t possibly go wrong” edge. Or maybe I really was a pessimist at one point (although I can’t quite imagine it; I don’t feel like a pessimist). Certainly living with his sunny attitude has changed me. Excellent advice, even when it hurts in the short term. Good point about hurting — I think the avoidance of pain, the fear of pain, often causes us to give up. Of course, it takes wisdom to discern when pain needs to be gritted through, and when it’s a dire warning that we’re on the wrong track! I think living with a perpetual peace of mind, fully content of what I’m and what I’m doing. I know it is not glamorous but I truly believe mind peace is the key to my happiness. We’re the same on that note, Francesca. Excitement and glamour, while fun, are fleeting thrills for me. Tranquility and the peace of mind that comes from living according to my deepest, most heartfelt values — that’s the source of lasting happiness. Great mottoes for life Tracy. For me it will always be writing. I’m looking forward to your novel — it’s sounds fabulous. (I, too, love the sea, and find inspiration there). 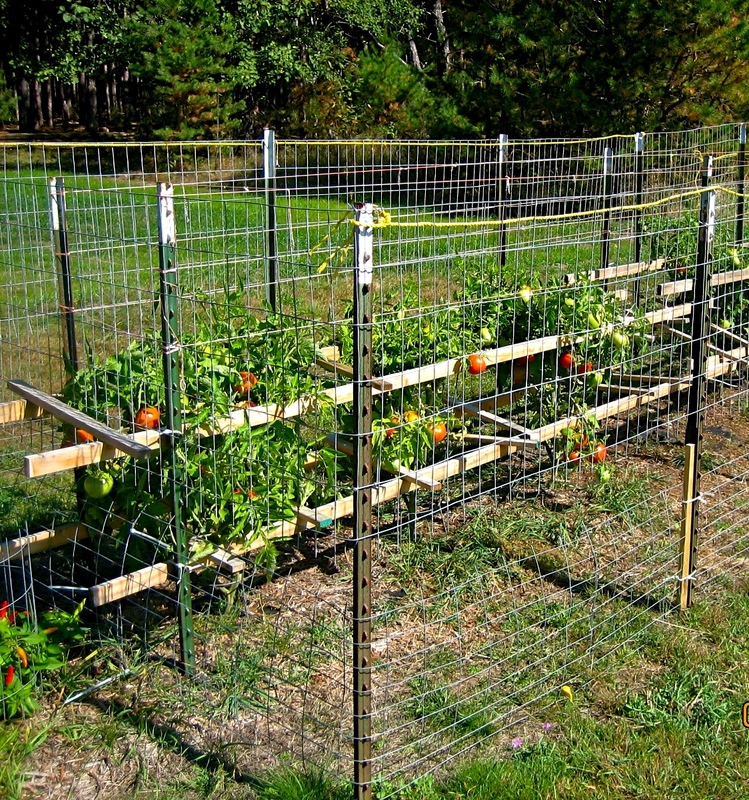 A great post and a clever ‘innovate’ tomato fence! So true and timely. I have so many dreams – and working on them already is a fulfilling process – but in the end I think I’ll go with one of the previous mentioned comments; finding a peace of mind… a work of a lifetime for a ‘Gemini’. Lol. but that’s part of the fun!! I love the deer fence, Tracy. Now if there was such a thing as a fence to discourage squirrels, big birds, etc., that would eliminate one excuse I could dream up for not starting a garden – tomatoes or anything else. I can’t take credit for the fence — that was Ken’s idea. Although they can leap over a 6 foot fence, and this one was only 4 feet, they didn’t because the area inside was too small to land in, and the fence was just high enough to keep them from reaching the tomatoes. If you need a fence to discourage squirrels or big birds, I”m sure my inventor-husband could design one. 😦 Poor peach tree! You can borrow Ken’s idea for fencing in your replacement peach tree if you want to keep those naughty deer away from it. Usually we can if we have the will, if it’s truly important enough to us to sacrifice some other comfort or convenience. I’ll be curious to find out where your examination leads you. My husband and I imagine all sorts of things, planning them out and acting as if we might do them, which we never actually do. I used to find that process frustrating, but he insisted it’s the best process for discovering not only what’s possible, but also for evaluating whether or not a desire is worth pursuing. Now I treat it as a kind of intellectual game, a kind of hobby that does not necessarily have any impact in the real world except to sharpen my powers of imagination and problem-solving.